Slutspillet ved VM i fodbold 2018 er den anden og sidste fase af konkurrencen, efter gruppespillet. Det begynder den 30. juni 2018 med ottendedelsfinalerne og slutter den 15. juli 2018 med finalekampen, der spilles på Luzjniki Stadion i Moskva. De to øverste hold fra hver gruppe (i alt 16) vil gå videre til slutspillet for at konkurrere i en eliminationsturnering. Ud over finalen vil der også blive spillet en bronzekamp mellem de to tabende hold i semifinalerne. Hvis resultatet af en slutspilskamp fortsat er uafgjort efter de 90 ordinære spilleminutter, går kampen ud i forlænget spilletid, hvor der spilles to halvlege à 15 minutter. I den forlængede spilletid er det tilladt for hvert hold at foretage en fjerde og sidste udskiftning. Ender det uafgjort efter den forlængede halve time, går kampen ud i straffesparkskonkurrence for at finde en vinder. Mario Mandžukić (venstre) sender et indlæg ind i feltet til Andrej Kramarić..
Hovedartikel: Verdensmesterskabet i fodbold 2018 - finalen. 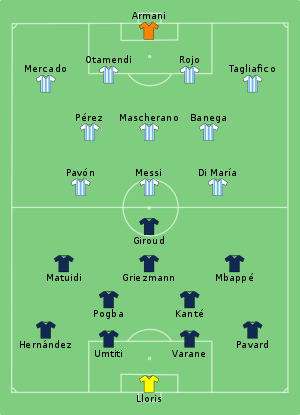 ^ a b c "Tactical Line-up – Round of 16 – France v Argentina" (PDF). FIFA.com (Fédération Internationale de Football Association). 30 June 2018. Hentet 30 June 2018. ^ "France v Argentina – Man of the Match". FIFA.com (Fédération Internationale de Football Association). 30 June 2018. Hentet 30 June 2018. ^ a b c "Tactical Line-up – Round of 16 – Uruguay v Portugal" (PDF). FIFA.com (Fédération Internationale de Football Association). 30 June 2018. Hentet 30 June 2018. ^ "Uruguay v Portugal – Man of the Match". FIFA.com (Fédération Internationale de Football Association). 30 June 2018. Hentet 30 June 2018. ^ a b c "Tactical Line-up – Round of 16 – Spain v Russia" (PDF). FIFA.com (Fédération Internationale de Football Association). 1 July 2018. Hentet 1 July 2018. ^ a b c "Tactical Line-up – Round of 16 – Croatia v Denmark" (PDF). FIFA.com (Fédération Internationale de Football Association). 1 July 2018. Hentet 1 July 2018. ^ "Croatia v Denmark – Man of the Match". FIFA.com (Fédération Internationale de Football Association). 1 July 2018. Arkiveret fra originalen 1 July 2018. Hentet 1 July 2018. 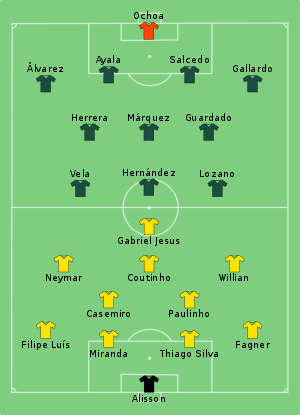 ^ a b c "Tactical Line-up – Round of 16 – Brazil v Mexico" (PDF). FIFA.com (Fédération Internationale de Football Association). 2 July 2018. Hentet 2 July 2018. ^ "Brazil v Mexico – Man of the Match". FIFA.com (Fédération Internationale de Football Association). 2 July 2018. Hentet 2 July 2018. ^ a b c "Tactical Line-up – Round of 16 – Belgium v Japan" (PDF). FIFA.com (Fédération Internationale de Football Association). 2 July 2018. Hentet 2 July 2018. ^ "Belgium v Japan – Man of the Match". FIFA.com (Fédération Internationale de Football Association). 2 July 2018. Hentet 2 July 2018. ^ a b c "Tactical Line-up – Round of 16 – Sweden v Switzerland" (PDF). FIFA.com (Fédération Internationale de Football Association). 3 July 2018. Hentet 3 July 2018. ^ "Sweden v Switzerland – Man of the Match". FIFA.com (Fédération Internationale de Football Association). 3 July 2018. Hentet 3 July 2018. ^ a b c "Tactical Line-up – Round of 16 – Colombia v England" (PDF). FIFA.com (Fédération Internationale de Football Association). 3 July 2018. Hentet 3 July 2018. ^ "Colombia v England – Man of the Match". FIFA.com (Fédération Internationale de Football Association). 3 July 2018. Hentet 3 July 2018. ^ "Match report – Quarter-final – Uruguay v France" (PDF). FIFA.com (Fédération Internationale de Football Association). 6 July 2018. Arkiveret fra originalen 6 July 2018. Hentet 6 July 2018. ^ a b c "Tactical Line-up – Quarter-final – Uruguay v France" (PDF). FIFA.com (Fédération Internationale de Football Association). 6 July 2018. Arkiveret fra originalen 6 July 2018. Hentet 6 July 2018. ^ "Uruguay v France – Man of the Match". FIFA.com (Fédération Internationale de Football Association). 6 July 2018. Arkiveret fra originalen 5 July 2018. Hentet 6 July 2018. ^ "Match report – Quarter-final – Brazil v Belgium" (PDF). FIFA.com (Fédération Internationale de Football Association). 6 July 2018. Arkiveret fra originalen 6 July 2018. Hentet 6 July 2018. 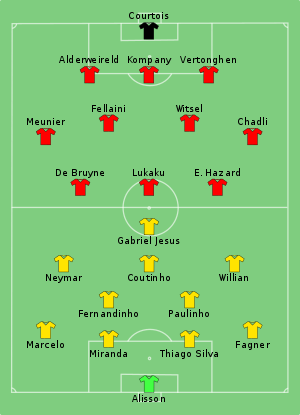 ^ a b c "Tactical Line-up – Quarter-final – Brazil v Belgium" (PDF). FIFA.com (Fédération Internationale de Football Association). 6 July 2018. Arkiveret fra originalen 6 July 2018. Hentet 6 July 2018. ^ "Brazil v Belgium – Man of the Match". FIFA.com (Fédération Internationale de Football Association). 6 July 2018. Arkiveret fra originalen 6 July 2018. Hentet 6 July 2018. ^ "Match report – Quarter-final – Russia v Croatia" (PDF). FIFA.com (Fédération Internationale de Football Association). 7 July 2018. Arkiveret fra originalen 7 July 2018. Hentet 7 July 2018. ^ a b c "Tactical Line-up – Quarter-final – Russia v Croatia" (PDF). FIFA.com (Fédération Internationale de Football Association). 7 July 2018. Arkiveret fra originalen 7 July 2018. Hentet 7 July 2018. ^ "Russia v Croatia – Man of the Match". FIFA.com (Fédération Internationale de Football Association). 7 July 2018. Arkiveret fra originalen 7 July 2018. Hentet 7 July 2018. ^ "Match report – Quarter-final – Sweden v England" (PDF). FIFA.com (Fédération Internationale de Football Association). 7 July 2018. Arkiveret fra originalen 7 July 2018. Hentet 7 July 2018. ^ a b c "Tactical Line-up – Quarter-final – Sweden v England" (PDF). FIFA.com (Fédération Internationale de Football Association). 7 July 2018. Arkiveret fra originalen 7 July 2018. Hentet 7 July 2018. ^ "Sweden v England – Man of the Match". FIFA.com (Fédération Internationale de Football Association). 7 July 2018. Arkiveret fra originalen 8 July 2018. Hentet 7 July 2018. ^ "Match report – Semi-final – France v Belgium" (PDF). FIFA.com (Fédération Internationale de Football Association). 10 July 2018. Hentet 10 July 2018. ^ a b c "Tactical Line-up – Semi-final – France v Belgium" (PDF). FIFA.com (Fédération Internationale de Football Association). 10 July 2018. Hentet 10 July 2018. ^ "France v Belgium – Man of the Match". FIFA.com (Fédération Internationale de Football Association). 10 July 2018. Hentet 10 July 2018. ^ "Match report – Semi-final – Croatia v England" (PDF). FIFA.com (Fédération Internationale de Football Association). 11 July 2018. Hentet 11 July 2018. ^ a b c "Tactical Line-up – Semi-final – Croatia v England" (PDF). FIFA.com (Fédération Internationale de Football Association). 11 July 2018. Hentet 11 July 2018. ^ "Croatia v England – Man of the Match". FIFA.com (Fédération Internationale de Football Association). 11 July 2018. Hentet 11 July 2018. ^ "Match report – Play-off for third place – Belgium v England" (PDF). FIFA.com (Fédération Internationale de Football Association). 14 July 2018. Hentet 14 July 2018. ^ a b c "Tactical Line-up – Play-off for third place – Belgium v England" (PDF). FIFA.com (Fédération Internationale de Football Association). 14 July 2018. Hentet 14 July 2018. ^ "Belgium v England – Man of the Match". FIFA.com (Fédération Internationale de Football Association). 14 July 2018. Hentet 14 July 2018. ^ (PDF)Match report – Final – France v Croatia. FIFA. 15 July 2018. Hentet 15 July 2018. ^ "France v Croatia – Man of the Match". FIFA.com (Fédération Internationale de Football Association). 15 July 2018. Hentet 15 July 2018. Denne side blev senest ændret den 13. januar 2019 kl. 18:04.